Our highly experienced equipment & crane operators are licensed and certified, with experience in all phases of construction (steel erection, pile driving, tower crane assembly, and general construction practices). 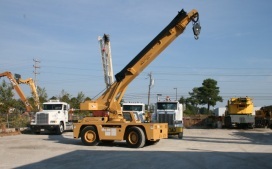 When you need the right equipment and operators for heavy construction you need Coastal Crane Service! to Myrtle Beach, Carolina Forest, Conway, SC, North Myrtle Beach, Little River, Longs, Surfside Beach, Pawleys Island, Georgetown, and beyond.